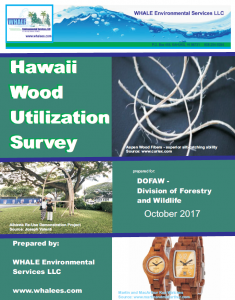 In October 2017, the Hawaiʻi Wood Innovations Steering Committee issued a Wood Utilization Survey. The purpose of the survey is to provide a knowledge base on the most pertinent market opportunities and obstacles in Hawai‘i’s wood products market, as well as priorities for the Hawai‘i Wood Innovations Steering Committee’s work. The survey summarizes data collected in interviews with major market participants and concludes with a set of recommendations to use market opportunities and to remove market obstacles.